There was a slight lift on 6m this afternoon, enabling me to try out my latest acquisition: an Elecraft PR6-10 preamp for the K3. A few days ago I noticed that the KX3 had a more sensitive receiver than the K3 on 6m. I couldn't allow my K3 to be outshone by its baby brother so the preamp was ordered. I felt that the K3 could do with a boost on some of the lower bands as well so I opted for the new PR6-10 dual band preamp which despite the name covers the range from 6m to 12m. It was obtained and delivered to me very speedily by Elecraft's UK agents Waters and Stanton. This was one Elecraft item that actually worked out cheaper to buy from the UK! The preamp was very easy to install. It is designed to fit on the back of the K3 using the BNC connectors for RX IN and RX OUT provided by the KXV3A board. The preamp's connectors are exactly the same distance apart as the ones on the K3 so you just need a pair of BNC couplers which Elecraft thoughtfully provided. I saw from the manual that the preamp was installed like this but I was afraid I would not have enough distance between the back of the K3 and the wall so I had ordered a couple of BNC patch leads as a precaution. In the end they weren't needed. Elecraft also provided a made-up cable to link the preamp to the K3's switched 12V output and its ACC socket so you can select the bands the preamp is enabled for. On other bands a pair of pass-through connectors are enabled. 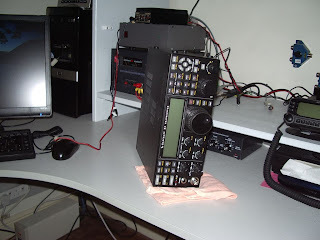 This was the main factor for choosing the ready-made Elecraft preamp instead of a cheaper home-brew one as it meant I didn't lose the use of the RX IN and RX OUT sockets that are utilized by the MFJ noise cancelling unit which is essential here on the 20m band. Installing the preamp involved dismantling the entire station. Although fitting the preamp to the K3 was easy, getting access to the back of the transceiver was not, and entailed the dismantling of almost the entire G4ILO station. Taking it apart may have been one thing, but putting it all together again is another. Labels fell off disconnected cables, other cables disappeared down the back of the table and had to be fished out again. If that wasn't enough, the meter illumination lamp in the MFJ magnetic loop control box chose this moment to fail, resulting in a lot of time wasted after I had reconnected it trying to find out what I had done with its power supply. Despite these hassles, installing the PR6-10 was worth the trouble, producing a clearly audible improvement in signal to noise ratio even on 12m. I can now hear stations that can't hear me!